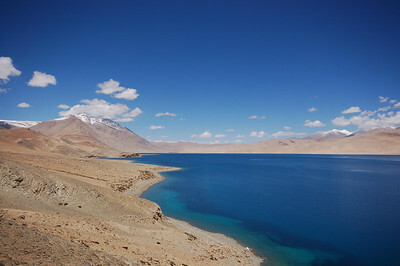 Tso Moriri Lake is a high altitude lake in south eastern Ladakh, in a nomadic territory straddling Tibet called Changthang. 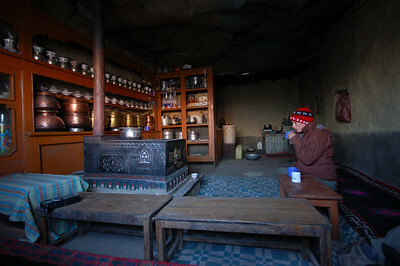 The nomads in Changthang are called Changs and on the Tibetan side they are called Khampas. Khampas are known for being fierce and strong (often referred to as cowboys), but our Tibetan guide told us that the Changs had lost some of that toughness by moving over to India. 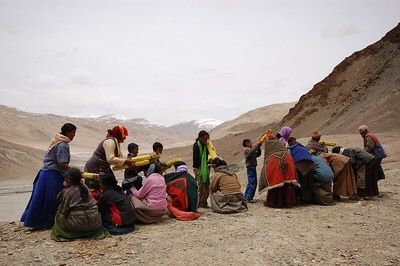 They live on Tibet in much greater numbers which has helped them to better conserve their traditional customs. Due to the fact that there are virtually no permanent settlements in the area, the public buses run only three times a month, on the 10th, 20th and 30th. We toiled with the idea of travelling by local bus, but they make the return trip to Leh the next morning and we wanted more time to see the area. We also wanted to make sure we didn't get stranded there. Jochen recruited two other travellers (unfortunately not the two hot, single Swedish women he was hoping for), and we pooled together to hire a jeep for the three day trip. Soon after the trip began, I knew I wouldn't regret having splurged (relatively) for the jeep ride, the highway to the lake is spectacular, we barely came across any other traffic during the entire 8 hour drive. Our Tibetan jeep driver seemed keen on stopping at the small village of Sumdho along the way, we realised when we got there that it was a Tibetan village and he was happy to get there and talk to all his friends. By amazing chance we arrived the one day of the year where the village celebrates a monastery festival. It is the culmination of weeks of prayers by visiting monks, who spend up to two weeks reading through the prayer books kept in the small Sumdho Monastery. When they are finished they parade around the town with other villagers each carrying prayer books. We spotted the procession up in the mountains when we pulled into the village. This gave us time to join the other villagers and visiting nomads waiting to be blessed by the procession. The blessing is given by placing by touching the forehead with the prayerbook. My first blessing was a real whack in the head by a very young boy carrying the heavy prayer book, I didn't know if I would be able to last through the whole procession. The cutest scene was the absolutely tiny uniformed children patiently waiting for their blessings (I noticed they were each rewarded with a candy for their hard work). 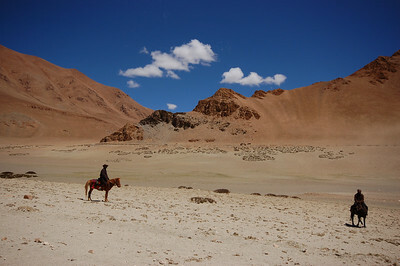 About 10km from Tso-Moriri the highway completely stops and we drove through the wilderness until pulling up at the lake and its only permanent settlement Korzok Village. We knew that there were ten village homes that had begun putting up visitors in their homes as part of a way of bringing more money to the villagers, who receive many visitors during the peak season but don't really reap any of the benefits of tourism themselves. We stayed in a home right beside the Korzok Monastery, each home has only one designated room for tourists so Yann and I got what appeared to be the meat drying chamber (but at reduced price, oh yeah!). 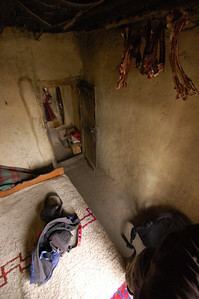 We had brought all our own food, as we had been warned that early in the season there might not be much around, Yann and I seemed to have two garbage bags full of dried yak meat at our disposition however. The Ladakhi kitchen is apparently the pride of the home, this one was no exception with a full collection of brass cookware and what I would guess was more dishes than were people in Korzok. The village of Korzok sits at over 4600m, so we spent our first evening in town mostly preparing dinner and going to bed early. The next day we spent trekking around the lake. Our two recruits ducked out early, probably affected by the altitude, as they had only arrived recently in Leh and had never been so high. Jochen, Yann and I continued the walk with me having to tame their ambitions of "reaching the snow peaks" and being back to Korzok in time for lunch. After a few hours of walking and some disagreement about the route we should follow, I took off along the shore line and the two boys wanted climbed higher up the banks of the lake. After a while Yann and I rejoined paths but Jochen had parted ways with Yann on the search for snow. Yann and I now took almost three hours to walk back to Korzok village, taking in what I think is the most beautiful scenery I have ever seen. As the day went on the lake turned from clear, to dark blue, to turquoise, and there wasn't another soul in sight save for a few shepherds and their pashminas. When we got back to the village we had lunch waiting for us, cooked by our friends who had now been waiting about 7 hours for our return. We expected Jochen to be waiting for us as well but he hadn't arrived yet. By five o'clock with no sign of Jochen both Yann and I began to worry. I had been carrying all the water and his jacket, so he was out in his t-shirt climbing to snowy peaks with no water. Yann and I were fairly exhausted from our eight hours of trekking and the hope of finding an injured Jochen in the barren rocky scenery would be quasi-impossible (I had earlier mistaken a pashmina goat for Yann). Getting impatient, Yann left our homestay to see if he could spot Jochen in the distance. I joined Yann a few minutes later and we spotted Jochen in the distance weaving through prayer flags in the mountains above the village. When he finally arrived back he was completely exhausted after more than ten hours of trekking and having to rely on snow for rehydration (I guess he made it to the snow peaks). We shared another communal meal and went to bed completely drained of energy, but not before having a peak at the clearest, starriest sky we'd ever seen. 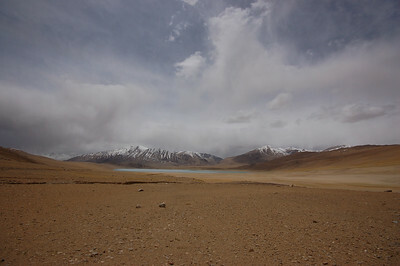 We took a different road back to Leh, on roads/dirt tracks through nomadic territory. White tents peppered the scenery and our driver stopped to talk to some of the horsebacked nomads who seemed to know him well. We made another stop in Sumdho, this time we visited the small school. Much to our surprise and delight we were treated to a concert, each of the four grades singing an English song for us and the whole school singing a Tibetan song for us. I don't think I have ever seen anything as cute as the Old McDonald's rendition complete with animal re-enactments. The school is part of a larger network of schools designated for newly arrived Tibetan refugees. After grade four, any student in Sumdho that wants to continue with school will have to board in Leh where there is a much larger Tibetan community. 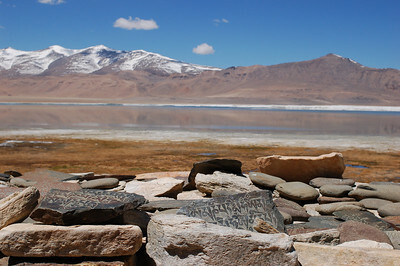 Our last stop was Tso Kar, a brakish lake that was once the centre of a battle between two nomadic groups who wanted control of salt harvesting. 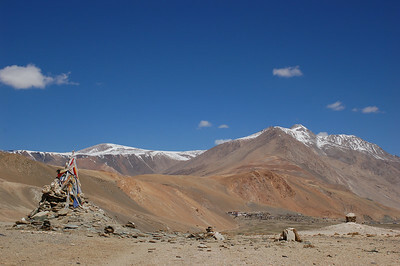 Tso Kar Village was a ghost town, with most of its inhabitants only living there for the cold winter months and returning to their nomadic ways for the warm season. There is something unbelievably special about the few remaining nomads in the region, hopefully all us tourists won't ruin the beauty of the scenery and the culture of the Chang. les photos sont tellement belles et représentent tellement le calme de la région, exceptionnel! Il me semble que c'est plus facile pour vous de visiter des régions comme celle-ci, que l'Inde avec son climat trop chaud. Encore merci pour nous faire connaître ce beau coin du monde. Incredibly stunning geography. If you say this is the "the most beautiful scenery" you've ever seen, I certainly believe you. A mon avis et celle de ma seour, je pense que les photos sont les plus belles, les prises de vue sont incroyablement belles, elles sont tellement belles que cela a l'air d'un montage et non du reel. Vous etes bien chanceux de voir tout cela mais faites bien attention a vous. 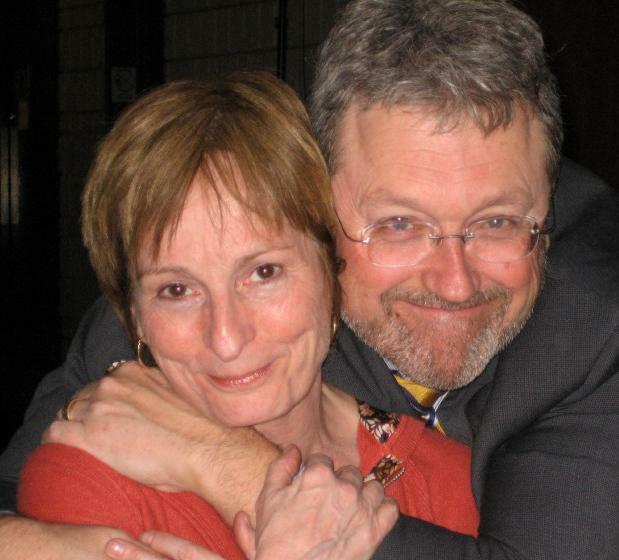 On vous aime beaucoup beaucoup et on pense a vous. Those two little boys with clasped hands are beyond adorable.I think you could do a book with your children pictures alone. Yeah, that photo is priceless. And even more fun/cute when you know they get a candy when it's done.